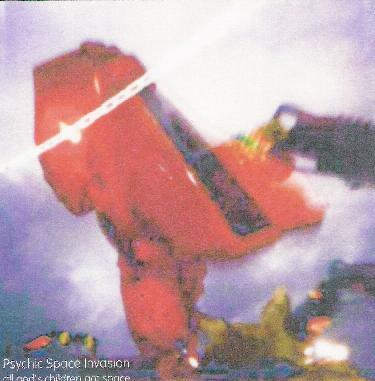 Psychic Space Invasion - "All God's Children Got Space"
This UK one man band (Ian Holloway) has released 7 CD-Rs on the Elvis Coffee Records label. This CD is one 43 minute piece of music. Be patient, sit back and absorb the sounds. It begins with a ringing like drone that is slowly taken over by another drone by the sound of an organ. As the ringing disappears and the organ sound develops into a special drone some spaced out sounds are starting to filter into the sound (17 minutes or so). It gets very spaced out in 20 minutes and then the sounds are modulated further until it slowly fades out into nothingness as it began. Phew... special stuff. And remember this is a very special record label in which all the releases are free, you only pay the postage! �5 for 1 CD or �for 3-4 CDs depending where you live in the world.